Blanket selling of risky assets has created echoes of 2008, when asset prices flocked south together. George Mitton asks if pension funds have learned to protect themselves this time around. The basic premise of portfolio management is that asset classes react differently in times of stress. A pension fund might spread its money across equities, bonds and precious metals because it hopes that a fall in equity prices will be at least partially offset by a rise in the price of gold. But the dirty secret about financial markets is that they do not always work this way. In periods of crisis, asset classes have a nasty habit of moving in the same direction – downwards. The 2008 crisis was an extreme example. With the exception of gilts, everything came crashing down together. Pension fund managers who thought their portfolios were safely diversified lost millions. Analysts say the risk that the financial system will return to a 2008-type scenario has increased in recent months. Are investment managers better prepared this time, and can they do anything to protect their clients? When people discriminate between different investment opportunities, and position themselves accordingly, the prices of those opportunities behave differently. This is what happens when the market is functioning efficiently. But if everyone indiscriminately buys one type of asset and sells another, assets become correlated. This can happen when the market adopts, en masse, a risk-off strategy. “Correlation is created because people treat investment opportunities in the same way, for example, blanket selling of risky assets,” says Brian Fleming, head of multi-asset risk and structuring at Standard Life Investments. Blanket selling can cause correlation to increase both between asset classes and within them. Equities might become more correlated with commodities, potentially compromising a portfolio manager’s hedging strategy. At the same time, stocks on the FTSE 100 might become more correlated with each other. 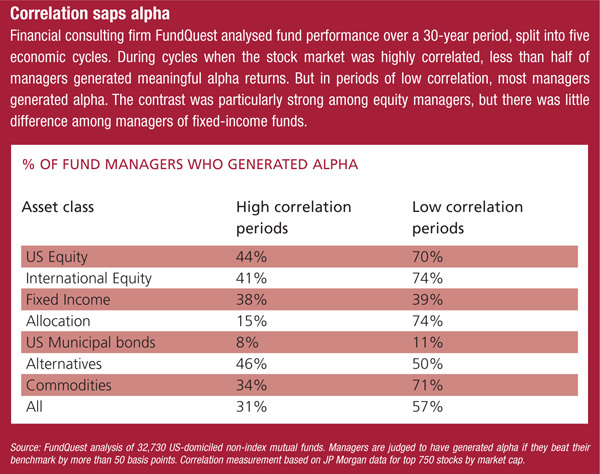 This could be disastrous for fund managers because it impairs their ability to generate alpha returns (see box, right). Pension funds and other big investors have a lot to lose if the current volatility tips into a full-blown crisis on the scale of 2008. But there are solutions. Clay Lambiotte, a partner at financial consulting firm LCP, says pension funds must become more sensitive to market movements. Absolute return funds, which aim to provide positive returns in all market conditions, are an increasingly popular choice for pension funds. Managers of these funds can use a mixture of strategies, including short selling, to limit drawdown in challenging markets. In theory, an absolute return fund can provide a source of returns that is uncorrelated to other asset classes during a stressful period. Lambiotte advises his pension fund clients to invest part of their portfolio in at least two absolute return funds. This style of investing relies heavily on manager skill so it is sensible to spread this skill risk. Absolute return is not a perfect solution, though. In practice, many such managers have not succeeded in generating positive returns in all market conditions. Another weakness is that their focus on hedging and drawdown protection means absolute return funds generally perform poorly compared with long-only funds during a bull market. But despite the drawbacks, these funds have become popular with pension schemes in the past five years, especially after 2008, which Lambiotte says was a “catalyst” for demand. Another strategy that is often mentioned in the same breath is diversified growth. Here, a client effectively outsources the asset allocation decision for part of its portfolio to a fund manager, who has the discretion to invest in different asset classes. 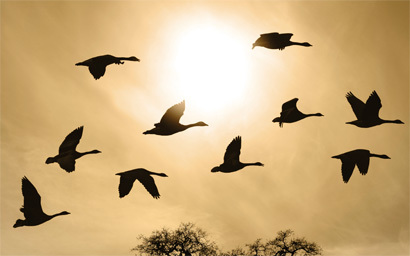 Imtayaz Ahmed, senior associate at financial adviser bfinance, says a fund manager can adapt a pension scheme’s portfolio to market movements more quickly than the scheme can. “The manager has the flexibility to shift allocations as and when they see fit, whereas for a pension scheme, it’s a lengthy process of going through committees and getting the approvals,” he says. There is not a clear distinction between diversified growth and absolute return funds. Both are multi-asset strategies and in each case managers can shift asset allocations dynamically. It is this flexibility that can benefit pension schemes during periods of high correlation. Another tactic is to buy insurance. One way to do this is with a derivative called a variance swap. Variance is a measurement of volatility and a variance swap allows a trader to profit if volatility is high. Because crisis periods are volatile, this offers insurance. But as with all insurance, you have to pay for it, and in times of high volatility can be expensive. The upshot is that portfolio managers should buy their variance swaps in advance when prices are low. Fleming at Standard Life says this should be part of an active approach to downside protection. The company’s Global Absolute Return Strategies Fund, an absolute return vehicle, decided to buy variance swaps earlier this year when, despite considerable underlying systemic risk, volatility was fairly low. It was an insurance policy. The challenge is to buy protection at the right time. Pension funds do not want to own insurance all the time because it costs them money. But neither do they want to buy it when the markets are in turmoil and the price is sky high. Emiel van den Heiligenberg is chief investment officer for global balanced solutions at BNP Paribas Investment Partners. He agrees that tactical thinking is the key to buying insurance. Again, the message from investment professionals is that it pays to be flexible. A portfolio is most vulnerable when it is static. If it is being carefully monitored and adjusted, and if managers are constantly looking for opportunities to buy cost-effective downside protection, the portfolio has a better chance of surviving crises. Lynda Stoelker, head of investment research at Stenham Advisors, says the attitude to insurance has evolved in recent years. “Investors learned some key lessons in 2008 in understanding the risks that were driving their portfolio and how correlated those risk factors could become in times of stress,” she says. The key is to be alert. More often than not, changes in correlation are driven by fear – the fear that causes investors to offload risky assets at the same time, for instance. Like the behaviour of a crowd, this is hard to predict. Any portfolio manager must be ready to adjust to changes in the market. A diversified portfolio will not be diversified in all conditions. Protecting against correlation requires an approach that is active, tactical and dynamic.